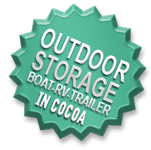 3 Self Storage Facilities Locations on Florida’s East Coast! Welcome to Mr Stor-It, the best self storage solutions to all your personal and business storage needs in Palm Bay, Merritt Island and Cocoa. All of our three self storage facilities in Brevard County are locally-owned and operated, and we offer a wide range of quality and convenient storage solutions and features to make your move-in with us a breeze. We have over 1,400 mini storage units and parking spots in the area, available with climate controlled storage, enhanced security, and easy access. Climate controlled storage provides excellent protection of your belongings from changes in temperature or humidity. No matter what you need for an efficient and convenient storage unit rental experience, we have it all. We offer a complete selection of moving and packing supplies for sale, UHaul truck rentals, and onsite business centers with fax and copy services available. We are proud to serve all local residents and businesses with a wide range of mini self storage unit sizes, standard & climate controlled storage. We have the lowest storage unit prices in the area. Our storage facilities’ offices are open 6 days a week, and our storage rental units have daily gate access with extended operating hours. We have convenient payment options such as online bill pay and AutoPay, and we also offer month to month storage rentals with no deposit required. All our storage units are located on the ground level with easy drive-up access, and our managers are available after hours by phone. Give us a call, email, or stop by to reserve your mini self storage unit in Cocoa, Merritt Island, or Palm Bay, and come see the difference when you store with Mr Stor-It!